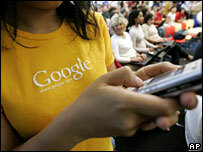 Google has launched a new search service for mobile phones, promising "faster" and "more relevant results". The facility gathers regular and mobile web results, news, images and local listings, meaning people no longer have to specify a type of search. An improved "local search experience" is based on Google's belief that mobile search is more often used to find area information such as cinema listings. The service is now available in the UK, France, Germany and Canada. It has been available in the US since March last year. Google believes mobile services have huge potential and have set up engineering groups in North America and the UK to develop new applications. Last year, the firm launched an operating system for mobile phones called Android, which it hopes will challenge existing platforms such as Window's Mobile and Symbian. The new search functions are part of that drive. People using Google on mobiles previously had to specify a search type in advance, or afterwards choose between different indexes such as local results, images or websites. The internet search giant now aims to provide the most relevant results from across the range of information sources. "The big thing that people will notice is that they just get the results they want, without them having to think ahead of time what sort of information they are looking for," a spokesman said. "You don't have to click through so many pages on that tiny little screen and on those tiny little buttons." He added: "Mobile search is more about seeking than browsing. "If you are looking to buy a digital camera then you are not going to do all the research for it on your mobile phone - it's not practical. "But if you are looking for a restaurant and you are out and about, it's as easy to access the number and address on your phone as it is to call a directory service." The new mobile search will also remember a user's recent search locations, so that subsequent searches for things like weather or restaurants will be geared to that area. Google is also experimenting with new features for its online search engine, including offering results in the form of a timeline or map. Is the web going mobile at last?